Introduction: This early paper on submarine cables was presented by F.R. Window to the 13 January 1857 meeting of the Institution of Civil Engineers and published in Minutes of Proceedings of the Institution of Civil Engineers, Volume XVI, Session 1856-1857, pages 188-202 (paper) and 203-225 (discussion). As Bern Dibner has noted, Window’s paper was “principally an engineering discussion of the early cables, but raising questions of priority, later rebutted by R. S. Newall.” See also Newall’s Facts and Observations Relating to the Invention of the Submarine Cable. Footnotes from the original have been consecutively re-numbered and arranged to follow the paragraph they reference. See also Window's 1859 pamphlet on the shortcomings of the failed 1858 cable, and a proposal for a South Atlantic route. by Frederick Richard Window, Assoc. Inst. C.E. C I V I L E N G I N E E R S .
 The discussion upon this Paper occupied portions of three evenings, but an abstract of the whole is given consecutively. THE rapidly-extending system of submarine and international communication has now assumed so much importance, and forms such a prominent feature in the daily transactions of life, that a short review of the subject, in an engineering point of view, must be interesting to the Institution; although the Author regrets, that no one abler than himself has undertaken the task. This invention, for connecting lands which Nature herself has separated with her most formidable barrier, and for linking together remote kingdoms in the common chain of civilization,-is a very modern discovery: yet so rapidly has it spread throughout Europe, that, from constant use, and familiarity with its manifold advantages, it has become, within a few years, a material fact, indispensable for our convenience and happiness, and is now an absolute necessity. Like the Electric Telegraph itself, its parent-age is difficult to trace: It was the emanation of no single brain, but had been a cherished dream, from an early date in the era of electric telegraphy, the probable realization of which every one admitted, although the means for its accomplishment were still unknown. The first mention, that the Author has been able to find, of any method of so sufficiently insulating wires, as to enable them to conduct an electric current, when submerged in water, is in an account of some experiments made by Dr. (now Sir W. Brooke) O’Shaughnessy, at Calcutta, in the summer of 1839, and described by him, in the “Journal of the Asiatic Society,” in the following terms:–“Insulation, according to my experiments, is best accomplished by enclosing the wire, (previously pitched,) in a split ratan, and then paying the ratan round with tarred yarn; or the wire may, as in some experiments made by Colonel Pasley at Chatham, be surrounded by strands of tarred rope, and this by pitched yarn. This was actual experiment, probably only on a small scale, but it is positive evidence. In 1840, before a Committee of the House of Commons, Professor Wheatstone, in reply to a question from Sir John Guest, stated that there would be no difficulty in passing the telegraph line through water, but that, the experiment had not been tried. The Chairman, Lord Seymour, then asked, “Could you communicate from Dover to Calais in that way?” to which the Professor, replied, “I think it perfectly practicable.” In the “Bulletin de l’Academie Royale des Sciences de Bruxelles” of October 17th, 1840, it is announced, that Mr. Wheatstone had discovered a means of insulating wires, so as to place Belgium in telegraphic communication with England, and other countries; and the various advantages that might he expected to result from such an undertaking are enumerated. From the present experience of the difficulties and requirements of submerged wires, it is a question, whether, at the date of these assertions, it would have been possible to lay down a wire, sufficiently well insulated to carry an electric current across the Channel; but the demonstration, a few years later, by Professor Faraday, of the excellent non-conducting qualities of gutta percha, and its fitness for insulating telegraph wires, furnished the means of realizing these schemes, at the exact period when such a discovery was required. This vegetable production has long been well known, but has only lately been extensively employed commercially. It is peculiarly adapted for telegraph wires, as an insulating cover, whether for submarine, subterranean, or other and minor purposes. Tough, fibrous, flexible, and of easy manipulation; capable of being welded, or joined, of being moulded and compressed into any form, a non-conductor of electricity, capable of resisting acids, and any chemical action, and unaffected by sea-water; it would be difficult to imagine a substance better suited to aid the engineer, in forming electric communications. A paragraph from an American newspaper states, that  “Colonel Colt was the first man who ever carried a telegraph under the sea. This paragraph was furnished by Colonel Colt, but there was no indication from whence it was taken, or of its date.--EDITOR. Lieutenant Siemens, of the Prussian Royal Artillery, is stated to have constructed, in 1848, a telegraphic communication under the Rhine, between Cologne and Deutz, a distance of about a quarter of a mile, by means of a wire covered with gutta percha. The first recorded experiment in England, with gutta-percha- covered wires, immersed in the sea, was made off Folkestone harbour, on the 10th January, 1849, by Mr. C. V. Walker, Telegraph Engineer to the South-Eastern Railway Company. Upon that occasion, two miles of gutta-percha-covered wire were towed out to sea in an open boat; the ends of this wire were carried on board a steamer moored alongside the pier, and one of them was joined to a London wire; the other was connected to an instrument, and a communication was established between this latter and the earth, by hanging a copper plate, connected with it by a wire, overboard into the sea. All electric shocks, therefore, sent by the battery belonging to the instrument, had to pass along the submerged wire, on their passage to, or from London, and if the insulations had been imperfect, they could not have been deciphered upon the’ instruments, as “the earth,” in this instance represented by the sea-water, would have been reached by the shorter circuit offered by the imperfections in the gutta percha. It was found, that the signals passed quite as well, as along a suspended wire; and many communications were sent between the steamer and London in the course of the day. This was a most important experiment, and the first of its kind. In 1847, a concession was granted, for ten years, by the French Government to Mr. Jacob Brett, for a submarine telegraph between England and France: but it was allowed to lapse. On the 10th August, 1849, a second concession (also for ten years) was again granted to Mr. Jacob Brett for the same purpose; and, in pursuance of the stipulation, in August, 1850, a copper wire, covered with gutta percha, about half an inch in diameter, was laid across the Channel, from a point on the English coast, near Dover, to Cape Grisnez, a headland in the vicinity of Calais. It was weighted, at intervals of about half a furlong, with lumps of lead, to prevent it from floating on the surface, as it would otherwise have done, owing to the low specific gravity of the gutta-percha. A few complimentary messages were sent between the two countries: but, on the following morning, when the engineers of the French Government arrived to inspect the wire, and to make their report, it was discovered that the communication was broken, and as they imagined that no telegraphic signals had ever been transmitted, they reported accordingly, and the concession was lost. On the 23rd October, 1851, another concession, also for ten years, was obtained, in favour of Lord de Morley, the Honourable Frederick William Cadogan, Sir James Carmichael, and John Watkins Brett, and under this concession the Submarine Telegraph Company now works. The probability of a submarine telegraphic communication between France and England still appeared to be remote. The scheme was disapproved of by several engineers in England, and all the French engineers declared it to be impossible. Contractors noted for their enterprise and liberality refused to undertake its construction, and the public, when applied to for funds through an excellent Direction, by means of a prospectus subscribed only £300. The lapse of time allowed for the fulfilment of the conditions of the concession had but seven weeks to run. Affairs were in this state, when application was made to Mr. Crampton, who was deeply interested, as a shareholder, in the undertaking. He professed confidence in the feasibility of the scheme, and engaged not only to put the mechanical and engineering portion in a practical shape, on his own responsibility, but to provide one-half of the necessary capital. In seven weeks the means and manner of carrying out an undertaking such as had never been known before were devised; the form of cable suitable to all the requirements of the case was decided upon; the machinery necessary for its manufacture was invented, designed, made, and erected; the cable itself was manufactured; and on the 25th September, 1851, it was laid at the bottom of the channel, with perfect success, notwithstanding that the vessels at Mr. Crampton’s disposal were avowedly unfitted for the purpose, a circumstance which could not be avoided at the time, owing to the urgent need for despatch. It is thus probably owing to the energy, skill, and courage of Mr. Crampton, in adhering to his conviction of the practicability of a scheme which was almost universally condemned by the highest authorities as chimerical, that the public is indebted for the actual possession of a submarine telegraph. Indeed, subsequent events prove this, almost as much as the first fact of the successful completion of the Calais line. On finding that the cable had really been laid down, and that it continued, day after day, in a serviceable condition, submarine telegraphs began to be considered as a fact, and contracts were entered into for the construction and laying down of other lines. However, three successive attempts were made to connect England and Ireland by a submarine telegraph, and in every case with signal failure. The first was between Holyhead and Dublin; the second and third, between Port Patrick and Donaghadee. All these cables were lost. Upon this, the success of the Calais line began to be looked upon as a lucky chance, not probably to be repeated; and Messrs. Newall, the Contractors for the Ostend cable, offered a large sum of money to be released from the responsibility of laying it down; but on Mr. Crampton, at the time one of the engineers of the Company, offering to undertake it, the operation was subsequently performed by the contractors with perfect success. If the three above-mentioned failures had occurred before, instead of after the success of the Calais line, which clearly demonstrated the possibility of such an undertaking, it is a question whether, to this day, any submarine telegraph would have existed. The Author has, therefore, treated this portion of the subject at considerable length, because he considers, that in a treatise on the submarine telegraph, the name of Mr. Crampton should stand foremost, though the names of his assistant, Mr. Wollaston, and also those of Messrs. Statham, Wilkins, and Wetherly are deserving of honourable mention. The cable laid from Dover to Calais in September 1851, consisted of four gutta-percha-covered copper wires, protected against the evils which had proved fatal to the first, by a coating of galvanized iron wires. This cable, which is about twenty-four miles in length, has remained perfect to the present time, and is still the medium of communication between the two countries. In May, 1853, a cable of six wires, protected in a similar manner, was laid down, under a concession granted by the Belgian Government to the same Company, between Dover and Ostend; a distance of about sixty miles. Early in 1853, “The Magnetic Telegraph Company” laid a very fine cable, of six wires, from Port Patrick to Donaghadee, with perfect success. The length is about twenty-four miles. In May, 1853, a cable, consisting of one gutta-percha-covered wire, with a galvanized-iron wire coating, was laid by “The International Telegraph Company,” (a branch of “The Electric Telegraph Company,”) between England and Holland. The point of departure was Orfordness, in Suffolk, and that of arrival Scheveningen, a small fishing-town on the Dutch coast, three miles distant from the Hague. The length of sea-way was one hundred and fifteen miles. Two similar cables were added in the same year, and in 1855, the system was completed with a fourth. In August 1854, a cable of a like construction, about fifty-nine miles long, was successfully laid, by the same company, between Holyhead and Howth. The above are the chief submarine lines proceeding from this country; but the applications of the principle in the interior of the kingdom, including the passage of the Solent, several friths, navigable rivers, and canals, are very numerous, though they scarcely merit special mention. An English company has also just laid a magnificent cable of six wires from Spezia to Corsica, the first portion of a line to connect the continent of Europe with the northern coast of Africa. The part completed is one hundred and ten miles in length, and the whole distance will exceed two hundred and fifty miles. England having led the way in this kind of enterprise, the example was speedily followed by most of the European governments, who invariably keep the management of the electric telegraphs in their own hands. The Danish islands have been joined to the mainland, and rivers which had hitherto caused a break in several lines, have been crossed by submarine cables, most of which were constructed in England. America has also made extensive use of the invention, for passing her mighty rivers, and Prince Edward’s Island has been connected with Newfoundland, by a cable of one hundred and fifty miles in length. The system has also been advantageously introduced into India, and indeed wherever electric telegraphy is known. It is a curious, though well-known fact, that all the great marine telegraphs have been laid down under peculiar difficulties, with regard to weather: as though Neptune resented this unwonted invasion of his territory. This was more particularly the case with the Calais cable, which was made to describe unexpected curves at the bottom of the Channel; and at one place, it was drifted some miles out of its course, the tug-rope having broken. The consequence was, when near to the coast of France, it was discovered that, from these causes, the wire would not reach the shore by half a mile; although four miles more than the actual distance had been put on board, to meet such a contingency. The necessary additional quantity of cable was, however, manufactured in a few days, and the line was satisfactorily completed. The first Dutch wire, also, was laid down under very unpropitious circumstances. The expedition started from Orfordness in a calm, but before it had got sixty miles out to sea, it was saluted with half a gale of wind, which rapidly increased. The storm continued all night, with great violence, but the operation of paying out the cable was carried on unremittingly, and the expedition arrived off Scheveningen early in the morning, with a stiff north-west wind blowing, and a heavy rolling surf, through which no boat could with safety carry the end ashore. That operation was, therefore, postponed for some hours; yet, notwithstanding all these difficulties, the whole distance of one hundred and fifteen miles was traversed with less than one hundred and nineteen miles of cable. There is but little to describe in the actual construction of a telegraph cable, “per se.” The Calais cable is formed of four copper wires, of No. 16 W.G., carefully covered with two coatings of gutta percha, after having been twisted together into a rope, and served with spun yarn and hemp saturated with tar. The telegraph wires arc generally thus twisted into a rope, instead of being laid straight in their iron coating, so as to afford greater facility for stretching without injury, in case of an unexpected strain on the cable. Round this core was spun an outer coating of ten iron wires of No. 1 W.G., or 5/16 inch diameter, welded into lengths of twenty-four miles each; thus forming as it were a kind of flexible mail round the tender gutta percha. The manufacture of this cable occupied twenty-one days, and the whole, when completed, weighed 180 tons. It will be noticed, that the main idea, in all the above-mentioned cables, is the same: that is to say; a copper conducting wire is insulated from contact with other wires, or the earth, by two cylinders of gutta percha carefully applied round it, one over the other; and this insulating material is itself protected from outward abrasion, by a covering of iron wires– a layer of some soft substance, (as hemp,) being placed between them, to guard the surface of the soft gutta percha, from immediate contact with the hard metal. Very many modifications have been suggested by various inventors, but they have all been based upon the above principle, with the exception of a cable invented by Mr. West, in which India Rubber is substituted for Gutta Percha, which he considers is well suited for insulating submarine cables. It may be remarked, that the cables laid down by the International Telegraph Company differ from all others of any importance, inasmuch as each conducting wire has its own separate coatings of gutta percha, tape, hemp, and iron wire, and forms a complete, independent cable of itself; whilst in all others, as many wires as are required are collected into a bundle, and enclosed together in one common hempen and iron coating. This innovation, which is due to Mr. E. Clark (M. Inst. C.E. ), has both its advantages and disadvantages The manufacture is simpler, and consequently the chances of imperfection are diminished. The weight, (in proportion to the length,) is less, and the whole is therefore more manageable which is a very important fact in the difficult operation of laying down. This method, also, offers great facilities for repairing any damage that may happen to the cables, for every wire being independent of all the others, can be overhauled in its entire length, without useless labour, or fear of disturbing messages which may be passing on the perfect wires. On the other hand, these cables are certainly more liable to damage from ships’ anchors, &c.; first, from the mere fact of there being many of them, instead of one; and secondly, because from their smaller section they are less capable of resisting a strain. This latter event has been partially guarded against by Mr. Clark, by twisting all the cables together into one, near the shore, upon shoals, in anchorage waters, and other places where such accidents are probable. The two methods do not materially vary in expense. The passage of electricity by submerged wires, as compared with that by suspended wires of the same conducting capacities, presents phenomena well worthy of study, and which deserve to be minutely considered, before undertaking the construction of submarine lines of very great extent. If one pole of a battery be connected with the earth, and the other pole be connected, (through a galvanometer, or coil,) with either end of a submerged wire, a rush of electricity into the wire will instantly take place, and be noted by a deflection of the galvanometer needle. But soon, although contact with the battery be continued, the deflection will cease, except such few degrees as are due to leakage, or the actual conducting power of the gutta percha. If the battery pole be then removed, and the end of the water wire put to earth, the electricity will rush out of the wire, and the galvanometer needle will be deflected in the opposite direction. These effects of charge are not observed in a suspended wire, in which the degree of deflection, owing to defective insulation, is alone shown, and that immediately. Professor Faraday in a lecture at the Royal Institution, explained how this takes place. It appears that the copper wire covered with gutta percha, and immersed in water, or buried in the earth, produces a Leyden Jar arrangement upon the gigantic scale of upwards of 80 square feet internal coating, and 320 square feet external coating per mile: the former being represented by the copper wire, and the latter by the film of moisture adhering to the outside of the gutta percha. Upon contact with the battery-pole, the copper wire becomes charged statically, with that electricity which the pole can supply, and acts, through the gutta percha, by induction, (without which induction it cannot itself become charged,) producing the contrary state of electricity in that film of water surrounding the gutta percha. Vide Lecture by Professor Faraday, “On Electric Induction–Associated Cases of Current and Static Effects,” delivered at the Royal Institution on the 20th January, 1854. The copper wire is generally 1/16th of an inch in diameter, and the whole covered wire gauges from 7/32nds of an inch, to 4/16ths of an inch. Davy: “Elementary Chemical Philosophy;” p. 154. Vide Faraday’s “ Experimental Researches,” Art. 1177. There being no outer coating to the suspended wires, (representing the earth, or the water in the case of a submerged wire,) these effects cannot take place. A slight momentary charge might, possibly, be detected upon a long, well insulated, suspended wire, owing to the fact of its being opposed throughout its distance to the surface of the earth; but from the distance between the inductric and inducteous surfaces, it would certainly be infinitesimally small. A much more important difference exists, with regard to time, in the conducting powers of submerged and suspended wires. Professor Wheatstone, who was the first to measure the velocity of an electric current, stated, in 1834, that it travelled through a copper wire, suspended in a room, at the rate of 288,000 miles in a second. However, not only does the velocity of a wave of electricity vary through different conductors, but it has been demonstrated that, by various circumstances, such as altering the intensity of the current, &c., its velocity along the same wire may be made to differ. Thus, if the ends of a conducting wire be connected with the inside and the outside coatings of a Leyden battery, and be so employed to discharge a jar, it will be noticed, that the striking point will be considerably shorter than when the wire is used alone. This is caused by the tension of the electricity being lowered by the lateral induction. In the submerged wires, also, the induction consequent upon charge, lowers the intensity of the current, and consequently the discharge, or conduction, requires a longer time. The following is a table of the measured velocities of electricity upon metallic conductors, given by several scientific men. It will be understood from what has been previously said, that notwithstanding the great difference in the results, it is perfectly possible, that the figures given for each experiment may be correct; the disparities being due to the difference of tension, or intensity of the current, occasioned by lateral induction, battery power, or, perhaps, to other causes. It is to be regretted that there is no record of the battery power used in any of these experiments; though the latest researches seem to prove this to be of less consequence than was formerly supposed. Mr. Latimer Clark states, that he experimented with great care on one thousand miles of submerged wire, with different battery powers, varying from one to one hundred pairs of plates; and that he found the velocity of the current in every instance to be identical, - about one thousand miles per second. Vide Liebig and Kopp’s Report: 1850. Vide Athenaeum, January 14, 1834, p. 54. The wires experimented upon in the last case were eight in number, and each was about two hundred miles in length; they formed the underground line of telegraph between London and Manchester, belonging to the Electric Telegraph Company. It will be seen, that when the wires were looped together in couples at Manchester, a series of distances of four hundred, eight hundred, twelve hundred, and sixteen hundred miles could be combined in the London office. A galvanometer was placed at each junction of the several loops, so that the passage of an electric wave at that particular point might be noted. A similar galvanometer was also placed between the battery and the wire, or what is termed on short circuit. Upon establishing contact with the battery, the needle of the first instrument, (separated from it by only a few feet of wire,) was instantly deflected; after an appreciable space of time the second was affected; then the third; and so on, each in succession, to the last, distant sixteen hundred miles from the battery, in which the deflection took place about two seconds later than in the first. So long as the current was continued, a constant deflection was shown by all the galvanometers, varying according to the leakage upon the line. When the battery was disconnected, the first instrument immediately fell to zero, the others following in succession, but the farthest did not resume its vertical position until upwards of four seconds after the first: thus showing a current flowing out at one end of the wire, while none was flowing in at the other end. It was found, that by a short connection of the battery, the passage of a wave could be traced along the wire, each needle, in turn, deflecting, and resuming its neutral position, before the succeeding one was influenced. Again, if after establishing contact with the battery, and then breaking it, the end was connected with the earth, a portion of the electricity in it rushed back again, and deflected the nearest needles in the reverse direction. This resulted from the wire discharging itself at both ends into the earth. In this manner also, by rapidly making and breaking the battery contact, and then connecting with the earth, a current could be sent along the wire through one, or more instruments, and then be recalled, before it reached the other coils; showing how signals may be sent by a perfectly insulated wire, which although good and legible at one end, never arrive at the other. None of these effects, as to time, are visible upon a suspended wire of similar length, the signals in the first and last instruments appearing to be simultaneous. A theoretic, although inappreciable, period, does undoubtedly elapse, in the passage of a current, but it cannot be measured by the eye with the above apparatus, and no charge can be noticed. In another experiment, made with the same wires, three of the galvanometers were replaced by steel points, and the current was made to pass through a strip of paper, soaked in ferro-prussiate of potassa, and thus to trace its passage in lines of prussian blue. A seconds clock also, connected with an independent battery, was arranged to make a dot upon the paper at every vibration of the pendulum. Four rows, or lines, of marks were thus produced, one under the other, the first representing seconds of time, and the others showing the presence of electricity at points upon the wire distant four hundred, eight hundred, arid sixteen hundred miles respectively from the battery. A current was sent along the wire during five seconds. 400th mile in 0.34 sec., being at the rate of 1176 per second. 800th mile in 1.06 sec., " " 754 "
1600th mile in 2.51 sec., " " 637 "
and that the wire, 400 miles long, discharged itself in 0.875 seconds. 800 " " 4.000 "
1600 " " 4.500 "
This difference of velocity upon the same wire is due, as before stated, to the lateral induction. In the last-mentioned distance, (sixteen hundred miles), the Leyden arrangement was of the enormous extent of 130,000 square feet internal, and 540,000 square feet external coating; represented respectively by the surfaces of copper wire, and of the film of moisture surrounding the gutta percha. The small difference observable in the time of discharge of the wire eight hundred miles in length, and that of sixteen hundred miles in length, is probably due to the fact, that the last eight hundred miles was not so well insulated as the first, and that, consequently, the current had an easier mode of escape into the earth. A current upon a long submerged wire, when recorded by the decomposing process, shows first, a mere point, which gradually increasing to a maximum thickness, remains unaltered until the battery is cut off, when it gradually diminishes to nothing. This proves, that power is consumed in exerting the lateral induction; then notifies the equal tension of the battery and induced currents, and finally shows the gradual discharge of the wire. Although a pretty and valuable experiment to the philosopher, this is a great obstruction in the working of telegraphs: what is sent as a dot, is produced at the other end of the line in the form of a double wedge (Figs. 2 and 3), and is liable to be mistaken for a line. Signals as they appear on a long Submarine Line. Signals as they appear on a Suspended Line. It will be observed, that the discharge invariably occupies a longer time than the charge; and since no subsequent signal can be made perceptible, until the wire is free, it follows that, in signalling, this time must be allowed to elapse between each wave and the next, deducting such lesser time as the following wave will require to reach its destination. In other words, the greatest speed, with which successive intermittent waves, in the same direction, can be received upon a submerged wire, is the time of discharge, less the time of charge, for a submerged wire of that particular length. For instance, from the above tables, intermittent signals along a submerged wire, could not be distinguished at a distance of eight hundred miles, unless a period of (discharge 4.00 seconds - charge 1.06=) 2.94 seconds be allowed to intervene between each. In actual practice this speed is very considerably increased, by employing an instrument, first invented by the Author, and afterwards patented and improved by Mr. Cromwell Varley, which reverses the current with every signal sent, and so enables the wire to discharge itself quicker. The difference in the working of electric telegraphs upon suspended and submarine wires, will now be evident. All electric telegraphs in actual use, depend for their signals upon a quick succession of waves. Some, such as Morse’s, and Bain’s, depend upon the number and their respective duration. Others, such as needle instruments, depend upon the number and their respective direction. Time, therefore, is an important element in all, though less so in needle instruments, than with others. There appears to be no practical limit to the speed of the transmission of intermittent waves, upon a suspended wire. The Author has seen a despatch transmitted by means of punched paper, and Bain’s process, at the rate of six hundred and forty words per minute: and although this speed, or anything even approaching it, has never been attained for continuous public service, still, it is possible, and needs only some simple mechanical appliance to render it practically manageable. Upon submerged wires, on the other hand, as has been previously shown, the transmission is rigorously restricted as to time, according to the length of the line; and upon submarine and subterraneous wires, as at present constructed, a certain maximum of work only can be done, in a certain time; and by no mechanical contrivance at present known, can this limit be passed, so long as the condition of the wires remains unaltered. It is very possible, that upon a submarine line between Ireland and America, one word with another, including the constant repetition of illegible signals that would be necessary, would occupy upwards of a minute in transmission, and consequently that each despatch of twenty-five words, with the code signals, would need about half an hour: thus making forty-eight despatches of twenty words each per diem, the limit for each wire.
" each word, (average 6 letters,) 6 x 10, or 60 "
" code signals, repetitions of mistakes, &c. 25 + 5 or 30 "
However, since writing the above, the Author has been informed, that it has been proved by experiment, that reverse currents may travel, like a wave, through a wire, one after another; so that the American wire might hold two, or more, complete signals in it at the same instant, and thus augment the speed of working twice, or thrice, as compared with the rate of any one given wave.—F.R.W. It is not until a line is prolonged to six, or eight hundred miles, that the effects of the charge begin to be seriously inconvenient. Upon all the submarine lines in existence, it is very evident;but even upon the longest yet constructed, it is not sufficient to be of great annoyance. Messages are sent direct from London to the Hague, (a distance of two hundred and thirty miles, including one hundred and twenty miles of cable submerged in the Northern ocean, and twenty miles of subterranean wires beyond Ipswich,) at the usual rate of twenty words per minute. It is probable, that the speed of transmitting intelligence upon long submarine lines, will be increased by the ingenuity and invention which characterise the present day; but it is evident, that there will always be some limit of possibility, so long as lateral induction can occur. The Paper is illustrated by a series of Diagrams, from which the woodcuts Figs. 1, 2, and 3, are taken. January 20 and 27, 1857. I.K. BRUNEL, Vice-President, in the Chair. The discussion upon the Paper, No. 952, “On Submarine Telegraphs,” by Mr. F. R. Window, occupied both evenings, to the exclusion of any other subject. Mr. Window said, he had only referred, in the Paper, to the two kinds of submarine cables at present employed,—the simple cable, composed of one wire in each non-conducting envelope, a certain number of them being laid down side by side, so that in case of a casualty occurring to one wire the others might be made use of;—and the compound cable, wherein several wires were covered by one envelope of iron wire. He had alluded to the advantages offered by the simple cable, and this opinion, which was written some months back, had been confirmed by the recent casualties in the Channel. During the late gales, the Calais cable, which was of the compound kind, being torn asunder by the anchor of a vessel, there had ensued considerable inconvenience, until the transit of the messages could be arranged by another route; whereas the simple cables, although partially injured, had never ceased to be capable of conveying messages. He did not mean to say, that the simple cable would be the best for the connecting link between the west point of Ireland and the United States;but the case was worth consideration, at the outset of so important an undertaking. It had not been his object to disparage the attempt to convey telegraphic messages to America, nor did he mean to say, that the speed would be so slow as to be a bar to profit; but he had given his impressions, derived from experiment, chiefly with the view of eliciting information, from those who had better opportunities of investigating the subject. Mr. Charles Bright remarked, that some additions were necessary to render the Paper a complete report of the progress of submarine telegraphy up to the present time. The proportionate strength and weight of the different cables, and their construction; the depth and character of the bottom at the various sites, and the manner of paying out, as also some information as to the power used in the experiments recorded in the tables, should have been given. The proportions between the power of the current and the different lengths and kinds of wire should, likewise, have been examined. The chief point suggested for discussion, was the difficulty of working, at such a rate as should be commercially successful, through such a length of cable as that now being constructed to connect Europe with America. There was reason to believe, that the effects of the phenomena of induction and retardation were exaggerated. The electrical conditions of an underground wire coincided with those of a submarine wire. It was true, that electric currents, employed in the usual way, with the common needle and recording instruments, were so retarded, that if worked quickly the signals were confused, or blended together; but this could be effectually dealt with. The first important English underground line, coated with gutta percha, was that laid by the Magnetic Company, in 1851, between Liverpool and Manchester. On connecting the wires at each end, so as to form a continuous length of above one hundred and forty miles, the effects of induction were clearly seen, and a strong secondary current issued from the wire, on breaking contact. But Mr. Henley’s instruments met the difficulty, and promised, with some modifications, to overcome any extension of it likely to arise in the longer lines then contemplated. The novelty in these instruments was the mode of generating the current, its proportions as regarded intensity and duration, and in the method of acting on the needle. In the old plan a galvanic current was sent in one direction only, for each signal; the needle, or armature, being brought back to its place of rest by a weight, or spring. This, independently of the inductive effect, was objectionable, as that weight, or tension, had first to be surmounted by the current, and thus the power available to produce a signal was only the difference between the force of the current and the retaining power of the weight, or spring. In the system alluded to, the current was derived from a permanent magnet, and was (proportionately) more intense and rapid in its effect. The needle was equally poised on all sides, and worked as well horizontally as vertically. For each signal the needle was first deflected by a current in one direction, and then reversed by a current in the opposite direction, the currents being of precisely equal force and duration. This equality of time and force was a very important feature, for any difference was fatal to working through great lengths of wire affected by induction. In an instrument since contrived to work with reversed currents from a galvanic battery, in which the duration of the currents varied according as the signals, or pauses, were longer, or shorter, a short current was found not to be able to surmount the residual effects of a long one, and thus a proper neutralization did not take place. The increase of induction, by a current of great duration, was self-evident, and might be practically seen, by charging a well-insulated wire for some time; the return current, or discharge, had then more power than a brief current from the battery itself on short circuit. On the completion of an underground line from London to Manchester, no cause for discouragement was found; as, with some alterations, the instruments worked admirably. Since then, the underground system had been extended, without any inconvenience as regarded electrical working. Indeed, instead of being limited, the longest circuits had been worked at the ordinary business rate, about twenty words a minute. Now, each letter, with the reversing system, required an average of four currents to be sent, and taking five letters to a word, there would be four hundred currents per minute, in practice; which would, from their length, only allow of ten currents being sent in the same time, if the theory advanced was sound. In considering the mode of working through still greater lengths, it was obvious, that the principle would require a different apparatus. In conjunction with Mr. Whitehouse, whose researches and ingenious instruments were so well known, he engaged in a series of experiments, which had produced most satisfactory results. Some of these experiments were repeated a few months back, for the satisfaction of Professor Morse, through two thousand miles of underground wire, connected so as to form a continuous circuit, terminating at both ends in the earth. Intermediate instruments were placed at each loop, to test the action of the electrical waves throughout the entire length, without any creeping of the current from wire to wire, and galvanometers were inserted at the distant ends. Signals were then clearly defined at the rate of ten to twelve words per minute. Two large induction coils, three feet in length, excited by a powerful ‘Grove’ battery of fifty pint cells, but connected, for quantity, in sets of ten, were used to generate the currents. The power of working through very great lengths depended upon the force, duration, and proportions of the current used. From all that had been shown in the Paper, he contended, that no difficulty was likely to arise that could not be effectually dealt with in working from Ireland to Newfoundland, by the proposed Atlantic cable. The Induction Coil, stated by the Rev. Professor Callan to have been discovered by him in 1836, led to his devising, in 1837, an instrument for getting a rapid succession of electrical currents from the coil, and thus completing the coil, as a machine, by which a regular supply of electricity might be furnished.–Editor. Mr. T.R. Crampton exhibited portions of the submarine cables, extending between Dover and Calais, and Dover and Ostend, which had been ruptured during the recent gales, by a vessel dragging her anchor, and hanging upon those cables consecutively. He stated, that although such force had been used as had ruptured the iron wire, and twisted it in a remarkable manner, yet the gutta percha covering of the copper wire was but little injured, and only exhibited a simple and clean section, all the rest of the covering being in as good a state as when it was first laid down, five years and a half previously. This was the first accident of the kind that had occurred, and it was immediately repaired. Although his name had been prominently mentioned, in connection with the first successful and permanent application of submarine cables, he did not in any way claim the merit of the invention. The only improvement suggested by him was, that the external wires should be welded together, instead of being fastened by hoops. The merit that he did claim was, that when, at a particular juncture, the project for laying a cable from Dover to Calais was at a standstill, he took the matter up, at the instance of Messrs. Davis and Campbell, Solicitors, decided the course to be adopted, incurred the greatest risk, and carried it to a successful issue. He was, in fact, the first to realize an important project, whereby the world, by common consent, was materially benefited. No single individual, however, could execute a work of that kind in seven or eight weeks;and he had great pleasure in acknowledging the material assistance he received from Mr. Wollaston, an early labourer in the field;—and also from Messrs. Wilkins and Wetherly, who contracted for the manufacture of the cable, and designed in so short a time the machinery for constructing it. This machinery answered perfectly, although it was considered impracticable by Mr. Newall and Professor Gordon, who were supposed to be best acquainted with such matters. The manufacture of the cable was proceeding most satisfactorily, when, owing to circumstances to which it was unnecessary further to allude, it passed into the hands of Messrs. Newall and Co., by whom the same machinery and workmen were employed. The gutta-percha insulation was due to Mr. Statham, who so improved the machinery and the mode of manipulating that material, as to render it perfect for that purpose, after numerous unsuccessful attempts by others. He was most anxious to bring forward the legitimate claims to priority of all those who had made investigations upon which the system was based, but, as had been observed in the Paper, the determination of such questions was attended with much difficulty, as inventions, or discoveries, of this nature, resulted from the combined investigations and experiments of many minds. He might observe, with regard to the submarine cable laid between Dover and Calais, that, although unknown to him at the time, and indeed for three years subsequently, its main features were shown in an elaborate and carefully executed drawing, prepared under the direction of Professor Wheatstone, in 1840. It was worthy of remark, that the arrangements therein indicated, agreed very nearly with those of the cables which were most favourably regarded at the present time; and although there were points which would have rendered it unequal to all the requirements of a submarine cable, yet in the hands of a practical man, such a drawing would have been quite sufficient, in his opinion, to lead to the desired result. The cable was proposed to contain seven wires, insulated by tarred yarn, the best means then known, and protected as at present, by a covering of iron wire. The drawing also gave a section of the English Channel, where the line was proposed to be placed, which was identical with that afterwards selected, and of the mode of manufacture of the cable itself. This drawing came came into Mr. Crampton’s possession in 1854, and he was surprised to find, that so much attention had been bestowed upon the subject. There could not be any doubt of its authenticity, as it was known that Lutwiche, who made it, went abroad in 1841, and had not since been in this country. It was always said, that Lutwiche had aided Professor Wheatstone in working out the mechanical details of the proposed system of submarine telegraphs, stated by the Professor, before a Parliamentary Committee, to be practicable. In the submarine operations upon the ‘Royal George,’ under Colonel (now Major-General Sir C.W.) Pasley, this system was also used to a certain extent, as well as by Dr. (now Sir W. Brooke) O’Shaughnessy, in India. These facts did not, however, detract from the merit of Mr. John W. Brett, who agitated the question, and by his perseverance, kept it before the public from 1845 to 1850, (in the former of which years Mr. Jacob Brett obtained a concession from the French Government,) without, however, any successful result being arrived at. When the affair was nearly defunct, in consequence of the public refusing to subscribe to a scheme which was considered to be visionary, Messrs. Davis and Campbell, the Solicitors, having confidence in Mr. Crampton’s representations, offered to provide one-fourth of the capital, if he would subscribe the same amount, and would undertake the direction of the enterprise. 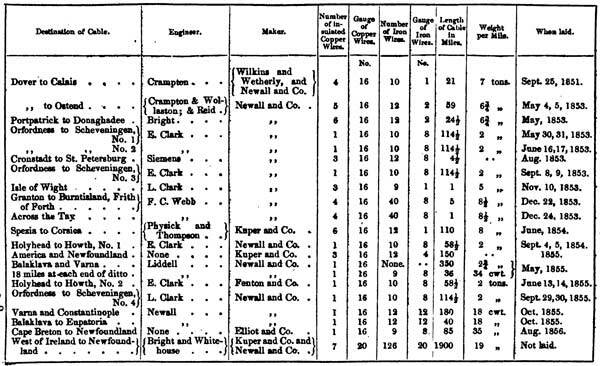 In his opinion, it was chiefly to the energy and confidence shown by these gentlemen, whose stake in the Company was afterwards largely increased, Mr. Crampton’s shares being at the same time equal to one-half the capital, that the ultimate success was greatly due, and that the cable was laid in 1851. These facts should be recorded, to show the difficulty of commencing undertakings, which, when accomplished, were easily extended. He might mention, that Sir James Carmichael had also rendered most essential service, both by embarking capital in the undertaking and by his advice; as well as by the great exertions he used to obtain a second concession from the French Government, the first concession having lapsed; but in this he was not successful. It would be admitted by Mr. Brett that his attention had been chiefly devoted to other than the practical parts of the undertaking, which had been executed by others. Mr. Window observed, that the experiment relative to the velocity of electrical currents on submerged wires of four hundred, eight hundred, and sixteen hundred miles in length, made by Mr. Latimer Clark, and referred to in the Paper, formed the subject of a lecture at the Royal Institution, by Professor Faraday, on the 20th of January, 1854. From this he had ascertained, that the battery employed was stated to consist of 360 pairs of plates (4 inches by 3 inches). Vide Lecture by Professor Faraday, “On Electric Induction—Associated Cases of Current and Static Effects,” delivered at the Royal Institution on the 20th January, 1854. Some misunderstanding appeared to exist with regard to an expression made use of in the Paper. It was nowhere stated, that by no appliance could any wire above a certain length be worked through, but that, although the difficulties of induction could be lessened, they could by no appliance be entirely avoided. Though allusion had been made to the fact of overcoming, to a certain extent, the effects of charge and discharge, due to induction, yet no description had been given in the Paper of the mechanical means by which these could be, and had been, diminished, because the technical explanations of such instruments were much more readily understood when given viva voce, and illustrated by the machines themselves. One of the first facts noticed was, the necessity for the employment of a battery giving electricity of a higher intensity than that used upon ordinary lines of the same length; this diminished sensibly the time of charging the wire, or the period that elapsed before the current arrived at its destination: but the discharge of the wire, which invariably occupied a longer time than the charge, remained unaltered. It must be remembered that, although lateral induction could be overcome by increasing the intensity of the current, according to the distance, yet this could not be carried beyond a certain point, for the electricity might have such an intensity as to destroy the gutta-percha covering, and so render the cable ineffective, a result which had taken place with a discharge from Rumkorf s coil. Many minor experiments were made, with more, or less success, to modify this effect. The magneto-electric telegraph seemed to be well suited for this purpose. It produced a current of great intensity, and the needle was returned to its normal position by means of a second current, of equal force and intensity, in the reverse direction, which had the effect of facilitating the discharge, or drawing off, as it were, the electricity accumulated in the wire. He had constructed an instrument calculated to perform the same office, by means of the galvanic battery. As the current thus produced could be made of equal intensity, combined with a greater quantity, than that of Mr. Henley’s instrument, it was probably more suited for very long lines. A double-headed permanent magnet, that was, a needle having two north and two south poles, was suspended over the poles of an electro magnet, in such a manner, that it was deflected in one direction, or the other, according to the nature of the current. This instrument was used as a ‘pecker,’ to bring a local battery into action, the motion to the left making a contact, and that to the right breaking it. Signals were sent by means of a key, which upon being depressed, sent a current in one direction, and on being released sent another current in the other direction. These currents acting upon an electromagnet at the other end of the line, caused a needle to deflect to the right, or to the left, in the one case making contact with a local battery, and in the other breaking it. An instrument embracing this principle was now in universal use upon all the Electric and International Telegraph Company’s lines, including the submarine wires to Holland and Ireland. It would be interesting to know, if the two thousand miles of wire upon which the signals had been sent at the rate of twelve words per minute, were extended in one single length, or whether they were composed of wires of the same cable, or inclosed in the same pipe under ground, and coupled up to that length. In the latter case a fallacious inference might probably be drawn from the result, as there would then be currents flowing in opposite directions, in immediate proximity to each other, and the induced currents would also be of an opposite nature, and thus neutralise each other. The effect of induction would, therefore, be very different to that upon a single insulated wire, of the same length, extended in a straight line. Mr. Bright remarked, that there was no such thing as two thousand miles of telegraph wire in one continuous length. In the experiment he had alluded to, ten separate lengths of underground wire, between London and Manchester, were connected together. As it was thought, that it might be inferred that the passage of the current was assisted by lateral induction, Professor Morse had tested this point very carefully, and had found, that the inductive effect from wire to wire was so slight, that a delicate galvanometer was not at all affected by it. It might, therefore, be fairly assumed, that no induction from wire to wire would affect the working of the instruments. He might mention, that, in conjunction with Mr. Whitehouse, he had tried some experiments on seven hundred miles of underground and submarine wires, in one direct length, from London, round by Scotland, to Dublin. This was the greatest length yet tried in a direct line, working to the earth, and in direct circuit with the wire,—and for that distance the results were most satisfactory. The coils used were about 12 inches in length. The coils employed in the experiment with the two thousand miles of connected wire were 36 inches in length, and were excited by a more powerful battery. Now, if they could work through seven hundred miles of direct wire, with the earth intervening, and could send an electric sensation through two thousand miles of connected wire, with four instruments in London, and four galvanometers in Manchester, he could not see what there was to prevent the working, successfully, through a direct line of two thousand miles. Professor Thomson, of Glasgow, was at one period a great opponent of the theory of the practicability of working through long distances, but he had seen reasons to change his opinion on the subject, and was now one of its warmest supporters. The instrument which had been shown, so arranged as to send alternate galvanic currents by the motion of a finger-key, was defective in principle. There was this disadvantage in it, that instead of each current being of equal length, the first current to deflect the needle was of one length, and the second to bring back the needle was not always of the same length, so that the sensation through the wire was not perfect . For this reason, when working at the ordinary rate of transmission through a long submarine wire, the pause between a short signal and a long one would not be sufficient, to enable the short one to overcome the residual effect of the long one; when they charged a wire for a long signal, for, say 1/10th or a 1/4 of a second, a shorter signal would not be able to overcome it. It was a matter of duration, and of strength of the current. The answer of the Author, with respect to the three-hundred and sixty cells, was not satisfactory, in an electric point of view. It did not appear, whether the intensity of the current had been increased, as the length of wire was increased from four hundred miles to eight hundred miles, and from eight hundred miles to sixteen hundred miles, or whether the same three hundred and sixty cells had been used in each case. Should the latter view be correct, as he imagined, then a different result could not have been expected, for the current would necessarily be slow. The tables from which arguments had been extracted against the successful working of long lines of submarine wire showed, forcibly, the weakness of those arguments. It had been stated, that Professor Wheatstone proved the passage of an electric current to reach the enormous speed of two hundred and eighty-eight thousand miles per second, and the table gradually descended to only eighteen thousand miles, with other experiments on the same class of conductors. If the nature of the exciting powers had been recorded, the statement would have clearly demonstrated, that different proportions of power produced very different results. The first experiments were made with high tension electricity, the last with currents of greater quantity, and hence the difference. Reasoning from theory, without regard to practical results, taught that a very much greater rate than that named in the Paper would be attained in the line from Ireland to Newfoundland. Professor William Thomson (Glasgow) observed, through the Secretary, that the Author appeared to deduce from a theoretical investigation of the conduction of electricity, that it would not be possible to send more than one signal every seven seconds through the submarine wire proposed to be laid between Ireland and America. Now, Mr. Wildman Whitehouse had, in actual experiments, exhibited the transmission of distinct signals, at the rate of four per second, through a greater length of underground wire than there would be required of submarine wire to connect Ireland with Newfoundland, for the United States line. He might remark, that in the Proceedings of the Royal Society (May, 1855), and in the Report of the Proceedings of the British Association, at Glasgow, in the same year, the theoretical objections now brought forward had been urged against the scheme, and satisfactory answers were given in the “Athenaeum” of November 1, 1856, and in a Paper read before the Royal Society in December, 1856 all the reasonings being derived from actual experiment. Vide "Proceedings of the Royal Society,” vol. vii., No. 13, pp. 382-399. Vide "Report of the Twenty-fifth Meeting of the British Association,” Transactions of Sections, p. 21. Vide. “The Athenaeum” for 1856, p. 1338. Vide. “Proceedings of the Royal Society,” vol. viii., No. 24, pp. 299-307. From these investigations it appeared, that without any direct trial on long subterranean, or submarine wires, but by reasoning on the known facts and measurements regarding electric conduction through copper, and electric induction across solid insulators, there were strong grounds for confidence, in expecting that a message of twenty words would not require more than seven minutes for its delivery, and that two hundred such messages could be sent during the day of twenty-four hours, through such a cable as was proposed to be laid across the Atlantic. There was even reason to think, that that rate might be ultimately exceeded, by the perfecting of the system introduced by Mr. Whitehouse. Mr. Latimer Clark said, that he had not been able to find any record of the battery power used in the experiments quoted by Mr. Window. He had, however, records of similar experiments made with varying battery powers, which he had undertaken partly at the request of the Astronomer Royal, and partly for Professor Faraday, at the time they were determining the difference of longitude of the observatories of Brussels and Greenwich. These experiments were necessary, in order to ascertain what allowance should be made for the velocity of the currents, and whether it was essential for the batteries in England and in Brussels to be identical. He worked through a length of sixteen hundred miles of wire, commencing with a battery power of only thirty-one cells, increased by successive additions, up to sixteen times that power, or four hundred and ninety-six cells; and with each of these powers he took copies, upon Bain’s paper, of the velocity with which the current travelled to the extreme end. He found no sensible variation in the velocity, which averaged about one thousand miles per second; though he soon ascertained, that there was no constant velocity. This depended upon many circumstances; to some extent upon the quantity of the battery power, but more than all upon the thickness of the coating, the size of the copper wire, and the consequent amount of induction that was going on between it and the earth. Since then, Mr. Whitehouse had, in his presence, made experiments, through similar wires, first with the voltaic battery, and then with the current induced by an electro-magnet, and a difference in the velocity obtained by the two means was certainly indicated. It might be imagined from the Paper, that no improvement had been made in the transmission of signals through submarine wires, and that the Electric Telegraph Company was still working at the slow speed described. This impression he wished to correct. The history of the affair was curious and brief. The difficulty of the induced currents was, he believed, first overcome by the Magnetic Telegraph Company, who employed Mr. Henley’s machine for the purpose. It had been found, that although a current occupied a lengthened time in travelling to the end of the distant wire, and a still longer time to die out of the wire, yet if waves, or alternate currents, of positive and negative electricity, were sent, they would follow each other with considerable velocity. That was the principle used up to the present time, to obtain greater speed through underground and submarine wires. Mr. Henley’s machine unwittingly did this, because at the time of its invention, underground wires were not extensively employed, and it was not designed with that intention. The next step originated with Mr. Window, who sent Mr. Clark the little instrument which he had described, and which he had been using for some kind of printing apparatus. Mr. Window thought that this machine, which acted on the principle of alternate reversed currents, by its sensibility and rapidity of movement, would overcome the difficulty appertaining to underground wires, and Mr. Clark was requested to try it. He referred it to his assistant, Mr. Cromwell Varley, to report upon. No report was however made; but some time after that, Mr. Varley took out a patent for a machine, in which the principal feature was the use of the reversed currents. He thought it important to observe, that although the crude idea of the use of alternate currents might have been derived from Mr. Window, still Mr. Varley had gone a stage further, and had introduced a variety of improvements, which bad rendered his machine almost perfect. Mr. Bright had alluded to a difficulty arising from the inequality of the currents. Now, Mr. Varley had invented a method, in which he commenced by sending a short, but very powerful current, resembling that of an induction coil, and ended by a current of much weaker intensity. By that means, all the advantages were obtained, as far as he could learn, of the induction coil. He believed the action of the voltaic battery could be made in all respects to resemble that of the current from the induction coil. Mr. Varley’s plan had this great advantage, particularly for overground lines, where there was an unavoidable escape of electricity from one wire to the others: that if an induced current was employed, in which a brief initial current only was sent, the machine, in the interim between two successive currents, was left passive, and was liable to be acted upon by accidental currents of a weaker character; but, by having a constant current, the magnet was not only moved to the proper side, but it was held there. When the current was reversed, the magnet was held in the opposite direction, and it was not likely to be affected by the weaker currents escaping from other wires. The system of using alternate currents, or waves of positive and negative electricity, had enabled currents to be transmitted at a greatly increased speed. Professor Faraday had stated, that he had sent two, or three successive currents, of an alternately opposite character, into the wire, and after waiting an appreciable time, had received them at the other end. Mr. Clark was not able to confirm these experiments, although performed in his presence, but he had no doubt of their correctness. This system, of employing alternate currents, was the only one in use at the present time, to accelerate the working of underground and submarine wires, and he had no doubt that two, or three signals might be made to leave the hand of the operator, before the first had been indicated on a distant instrument. Mr. Cromwell Varley asserted, that his invention was prior to that of Mr. Window. His attention had long been attracted to the effects of induction in underground lines, perceptible indications of which he had noticed in the original subterranean wires through London, then insulated, in leaden tubes, by pitch and cotton. This fact he reported to Mr. W.H. Hatcher, the Chief Engineer of the Electric Telegraph Company, in 1848. He then used this induced charge as a severe test of the perfection of the insulation; the retention of it by the wire, for a short time after the battery contact had ceased, being a much more delicate test than that obtained by the galvanometers then in use for that purpose. From that time he had repeatedly tried experiments with subterranean circuits, and with wires suspended in the air from poles. In the year 1851-52, when it was contemplated to connect London with Manchester and Liverpool, by means of subterranean wires insulated with gutta percha, he inferred, from observing the large amount of induced charge in the London street wires, compared with those suspended in the air, that it would not be possible to work between those stations, with the proposed wires, at a commercial speed, with the printing instruments then in use. Mr. Varley brought this matter before the attention of Mr. George Wilson, the Chairman of the Committee at Manchester, and he also mentioned it to the Engineer of the Company and to others. On the execution of the subterranean circuits these predictions were fully realised. Mr. Varley then considered how this difficulty might be obviated, and he invented a machine, which might be dated from October, 1853. This he had shown to the Secretary of the Electric Telegraph Company, but as he had not then obtained protection for it, for reasons which would be obvious, he kept it secret. It was whilst engaged in carrying out this design, that the ‘relay’ instrument of Mr. Window was put into his hands. With reference to induction, and the speed of electricity through submarine wires, he believed that the electric current would travel through any length instantaneously. There was no appreciable time, between the application of electricity at the one extremity of a long conductor, and its appearance at the other end. The experiments of Professor Wheatstone and others proved that fact. Dr. Faraday’s experiment with a suspended insulated globe and two insulated hemispheres, showed that the action of induction was only upon the surface, and that it was impossible to compress electricity into the body of a conductor. In all the experiments that Mr. Varley had made, there was no such thing as momentum, or inertia, evidenced by electricity. That being the case, it was only necessary to ascertain, whether a metallic conductor of very great resistance could entirely check the flow of the feeblest electric current. All experiments tended to show, no matter what the length, or resistance of the metal conductor, that it would conduct electricity through it, however feeble in energy, the quantity conducted being inversely in proportion to the resistance opposed to it. The lateral charge by induction was not a compression of electricity; it rested wholly on the surface of the gutta percha, or insulating covering, and was not in the substance of the wire. In Professor Wheatstone’s experiments, which indicated a velocity of 288,000 miles per second, the two wires were bent backwards and forwards, and were, therefore, under circumstances unfavourable to induction. But had the conductor been stretched out like a telegraph line, on poles, a slower speed would have resulted. This experiment, which showed that electricity occupied a longer time to pass across the intervals between the distant ends of the wires, than at the ends next the source of power, did not prove that electricity required time to travel along a conductor, but that the electric wave occupied an appreciable time in arriving at a sufficient intensity to leap over the interval. Had this separation in the centre of the circuit been increased, the speed would have been reduced. The mistake, as to the non-instantaneous conduction of electricity, had arisen from noticing only the arrival of the electric wave towards its maximum power, and not its commencement. The apparatus used being only capable of recording when the wave had reached a considerable intensity, the first and weaker portions of the wave were not observed. This explained the difference of the observed speeds of electricity from different sources, as also through conductors differently circumstanced. Electricity having neither momentum, nor inertia, being incompressible into a conductor, and being capable of travelling through any length of line, must begin to flow out at the one end, simultaneously with the application of the battery, at the other. As a doubt had been thrown out, as to the existence of more than one wave in the wire at the same time, Mr. Varley would observe, that he had seen two distinct waves in a subterranean line eight hundred miles in length. Mr. Wildman Whitehouse, taking up the subject where Mr. Latimer Clark had left it, felt bound to acknowledge, that his researches had fully borne out the statement of Dr. Faraday, that different and distinct waves of electricity might co-exist in any long submarine conductor, at the same instant of time. In a wire of one thousand and twenty miles in length, he had distinctly heard three signals of a single-stroke bell after the hand had ceased to transmit signals: and, in like manner, in a length of four hundred and ninety-eight miles, two such signals in arrear had been distinctly heard. In anticipation of the recently-proposed great extension of submarine lines, it had appeared to him desirable, that the laws affecting the transmission of electric signals in such conductors should be thoroughly understood. He had, therefore, endeavoured to work out some of the laws which governed these phenomena; inquiring whether the ratio of retardation was sensibly increased by increasing distances,—in other words, whether the tendency was towards an increase of retardation according to the square of the distance, or in accordance with the simple arithmetical ratio. Mr. Whitehouse, during the last two summers, had availed himself of the privilege of working out these problems, upon several cables which had been manufactured at Greenwich. Many of these results were obtained on a cable of one hundred and sixty-six miles in length. It had been made in two parts of eighty-three miles each, and each part contained three separate and perfectly insulated wires; thus giving a ready means of joining up six lengths in various ways, yet always having the ends under immediate observation. In this manner, currents were sent simultaneously, along parallel and contiguous wires, sometimes in similar, and sometimes in opposite directions, so that the effect of lateral induction, whether existing from wire to earth, or between wire and wire, might be ascertained. On another occasion the six lengths of eighty-three miles each were joined together, so as to form one total length of four hundred and ninety-eight miles. With this arrangement tests could be placed in each of the different loops of the long wire, so as, simultaneously, to note, at various distances, the progress of the current; making it record itself automatically, at its entrance at any of the eighty-three mile stages, and finally at the terminal station. He believed, that any attempt to make the currents record themselves by direct decomposition, as suggested by Mr. Latimer Clark, would be attended with inconvenience, and that with currents of low intensity, like many of those which he proposed to examine, it would be impracticable. These difficulties were obviated by the use of improved instruments, possessing these essential characteristics, that they were equally well fitted for purposes of philosophical inquiry, as for successful working in practical telegraphy. The receiving instrument, or ‘relay,’ was as sensitive as the best detectors hitherto used; so that a single cell, consisting of a piece of zinc and a piece of silver placed upon the tongue, sufficed to work through four hundred and ninety-eight miles and the earth, and had practically recorded signals upon a ‘Morse’ instrument. He inserted such ‘relays’ in the several junctions, or loops, of the cable, to note the rates of propagation, under various circumstances and conditions; so arranging them, with the use of a pendulum beating seconds, that upon the instant arrival of any current, a local battery should automatically print upon paper the time, in decimal parts of a second, which had been occupied in its transit. In this manner currents, not only too feeble to print by direct electro-chemical decomposition, but even weaker impulses, too feeble to be detected by ordinary galvanometers, were sent through considerable distances, and recorded practical results. Mr. Whitehouse had well considered the problem, as to what should fairly be deemed the first arrival of any given current, anticipating that theoretical objections might arise on this point. He thought that the first arrival of any current, up to the delicate standard of force alluded to, might fairly be termed the earliest practical arrival of the current for telegraphic purposes. With these means and appliances, he found, that the law of the squares, as hitherto held, was totally inapplicable to the phenomena in question, and that the tendency was to approach much more nearly to the simple arithmetical ratio. Having tried several thousands of experiments, under varying circumstances, he could now easily pre-arrange the conditions, and foresee the results. With an amount of electric force, inadequate as compared with the length of wire to be filled up, it was easy to see, that the retardation, occurring in the later portions of the transit, would follow a gradually augmenting ratio, in proportion to the increasingly exhausted condition of the enfeebled current; whilst if the amount of electro-motive force was greater, and more fairly related to the length of wire to be excited, then a more uniform rate of propagation of the electric wave would obtain, in the several portions of any given length of wire. Perhaps the most striking point in these researches, but still one in perfect harmony with all the rest, was, that with magneto-electric currents, he had obtained a rate of transmission two and a half to three times greater than that of any voltaic impulse he had tried. lIe produced automatic records, showing the comparative velocity of the voltaic and magneto-electric currents, tried under like conditions. There was this further advantage attending magneto-electric currents, that the wire could never be overcharged from an inequality in the due succession of positive and negative currents. This equal and alternate succession was indispensable, in order to obtain rapidity of signalling, as with a voltaic current, it would be almost impossible perfectly to equalize the amount of the successive opposite impulses. As the subject of lateral induction between wire and wire had been introduced, he would state that this point had received minute and patient investigation. He had applied the severest tests, and had found that the results obtained would have been quite inappreciable, in all ordinary telegraphic operations. He had found a current, whose magnetic lifting power was 18,000 grains, when sent into a wire of one hundred and sixty-six miles in length, produced in an adjacent parallel wire, of equal length, a transient current of only 1½ grains by lateral induction, or one in ten thousand, a proportion insignificant in amount, when compared with the full current under examination: and it was further proved by experiment, to exert no influence on the rate of propagation. In the further prosecution of this object, repeated experiments were made, with the view of comparing the results obtained, when the wires were used backwards and forwards, as in loops, with those obtained under other circumstances, when the current was made to enter the cable always from the same end, so that if in the former instance the wire always contained opposite currents, in the latter arrangement they would always convey like currents; yet, under no circumstances, could he find that induction from wire to wire in any way interfered with the rate of propagation of the electric impulse, or with any of the practical results. He, therefore, deemed it fair to conclude, that the experiments which had been tried with Professor Morse, and Mr. Bright, upon a length of two thousand miles of subterranean wires, connected together between Manchester and London, and worked through with test instruments, inserted at every loop, might be accepted as fully reliable, and free from any appreciable amount of error due to induction from wire to wire; more especially as the results then obtained were in full and complete accordance with the conclusions legitimately deduced from previous experiments. Sir Charles Fox stated that, in 1850, Mr. Henley called upon him, after having shown the magnetic telegraph instrument to some acknowledged authorities, by whom it was pronounced to be a pretty toy, but of no practical utility. Sir Charles Fox, however, happening to entertain a different opinion, took the instrument to Professor Faraday, who expressed the opinion, that it was the best telegraphic instrument he had seen, and that he believed the magnetic fluid would be found to be better than any other form of electricity for telegraphic purposes. Mr. Bidder, V.P., remarked, that it would have been desirable if some further information had been afforded, as to the means proposed to be adopted in laying the Atlantic cable; neither its construction, the materials to be employed, nor its strength, had been satisfactorily explained. Doubtless many contingencies would arise in carrying out this great undertaking—and it had not been stated how these were proposed to be overcome. The great depth at which the cable was to be laid would cause an unsupported length of upwards of two miles and a half to be presented to the action of currents, and to the shocks imparted during heavy seas. The strain upon the covering of iron wire would amount to 17 tons per square inch, and the compression of the gutta percha to 2½ tons per square inch. It was just possible, that the strains so brought upon the cable might, in some degree, be taken off by the resistance of the water, and be partially expended throughout the whole unsupported length, and operate in straightening the curve it would assume; but, on the other hand, they might be more limited in their range, and then the question arose, whether the cable was sufficiently strong to meet these strains? It was true, that the Mediterranean cable had been laid at as great a depth, and was said to have failed only from a deficiency in the length; but, from whatever cause, it was a fact that that communication had not been made. Every one must feel a deep interest in the progress of an undertaking, which could not fail to exercise so important an influence on civilization and on commerce, and he would repeat the hope, that all would willingly contribute suggestions, which might have the effect of lessening the chances of failure, and of so insuring its probable success. Mr. C.W. Siemens observed, that the subject under discussion involved two principal questions, which should be discussed separately, namely, the mechanical one of insulating, shielding, and submerging the metallic conductor, and the electrical question of transmitting messages through it when laid. The first question had been treated by the Author of the Paper, and by most of the previous speakers, purely in a historical point of view; and some erroneous statements had been made, which it was important to correct. The non-conducting property of gutta percha was discovered, in 1846, by Mr. Werner Siemens, of Berlin. Being appointed a Member of a Royal Commission, charged with devising a plan for the establishment of Electric Telegraphs, in Prussia, he proposed, in the spring of 1847, the adoption of underground line wires, coated with gutta percha. In the autumn of the same year, he completed the first experimental line of twenty miles in length, between Gros Beren and Berlin, which was found to work successfully. Encouraged by this success, the Prussian and other German governments, adopted the underground system generally, and in the years 1848 and 1849, about three thousand miles were so laid. In March, 1848, Mr. Werner Siemens submerged in the Bay of Kiel several miles of copper wire,—coated with gutta percha by means of the cylinder machine, which he had invented in 1847,—for the purpose of establishing an electric communication between the shore and several points in the deep channel, where mines had been laid for warlike purposes; and this was undoubtedly the first attempt ever made to establish submarine communications. In dealing with long underground line wires, Mr. Werner Siemens became acquainted with the lateral induction, or electric charge of the wire; and having fully investigated this interesting phenomenon, he devised means for counteracting its disturbing influence. In a former discussion at the Institution, upon a Paper by Mr. Window on “Electric Telegraphs," read in February 1852, Mr. Siemens fully described the working of the underground Electric Telegraph, and the facts disclosed during that discussion tended powerfully to the introduction of that system into this country. Vide Minutes of Proceedings Inst. C.E., vol. xi., pp. 299 to 329. Ibid., pp. 362 to 366. The question of the retardation of electric waves, in passing through long submarine cables, seemed still to be involved in mystery. Professor Thomson, in his Paper read at the meeting of the British Association in 1855, enunciated the theory, that the retardation increased in proportion to the square of the length of the cable; whereas Mr. Whitehouse maintained, that the retardation increased only as the length, an opinion which he substantiated by the results of experiments. Now, Mr. Siemens contended, that Mr. Whitehouse’s experiments did not disprove Professor Thomson’s theory, but rather corroborated it, if all the circumstances of the experiments in question were taken into account. It had been supposed, that the increasing resistance in long conductors might be overcome by proportionately increasing the electro-motive force; but Nature had imposed its limits in this direction, for if the force became excessive, the discharge would no longer pass through the length of the cable, and back through the earth, but would cross the insulating medium in the form of a spark, and disable the entire cable. It had also been proposed, to send a considerable number of waves of positive and negative electricity simultaneously through the cable, but Mr. Siemens asserted, that the number of waves which could in that way pass through long cables, without destroying each other, was limited to three, or four. He did not believe that it would be possible to send through the projected Atlantic cable, more than one word per minute. Vide “Report of the Twenty-fifth Meeting of the British Association,” Transactions of Sections, p. 21. Mr. Siemens had carefully investigated this subject, and had, he thought, discovered means of accelerating the passage of an electric wave through a cable to twice its natural velocity, by simply returning the current through a second insulated wire within the cable, instead of through the earth. The two wires being simultaneously charged, the one with positive and the other with negative electricity, completely neutralized the electric charge of the metallic covering of the wire. Other disturbing causes, such as the magnetization of the surrounding iron covering, which exercised a very considerable retarding effect upon the electric wave, would also be removed. The positive and negative waves in the two enclosed wires, would likewise mutually accelerate each other, by voltaic induction. In the experiments of Mr. Whitehouse, the line wires had accidentally been under precisely similar circumstances to those provided by Mr. Siemens, but, judging from the projected Atlantic cable, it did not appear that the advantages obtained had been appreciated, as otherwise the cable would have been constructed on totally different principles. Professor Faraday, in stating his view of the cause of the difference in the velocity of the currents in different wires—which difference was in some cases as 1 to 100—would endeavour to avoid referring to his own theoretical views, because the facts stood apart from all theory. In sending a current, by means of a battery, one end of which was connected with the earth, through a gutta-percha-covered wire, to a point where it also was connected with the earth, a touch was given at one end of the voltaic battery, an impulse passed into the wire, travelled to the other end, gave its indication upon a magnetic indicator, and then passed away. If that was done with a wire suspended in the atmosphere, the current passed through almost instantaneously; at all events the time was hardly appreciable, in a wire one hundred miles in length. Now, if a Leyden apparatus, connected with the earth, but unconnected with the wire, was put into momentary communication with the voltaic battery, it would become charged. All experiments went to show, that the time occupied in the charging was very appreciable. The air wire alone transmitted the electricity it received from the voltaic battery very rapidly, but when connected with the Leyden battery, the electric impulse was occupied, in part, in raising up an induction in that apparatus, which was afterwards discharged through the wire; the discharge, and therefore the signal, being, however, retarded. When the wire, with its insulating covering, was made into a cable, or put into the earth, or water, it became itself a Leyden arrangement, the wire being one lining of the jar, while the iron, earth, or water was the other. The electricity then had to perform a double action, that of charging the arrangement, and that of sending on a current; the portion occupied in charging was for the time ineffective, as an advancing impulse, and though the charged part was at last discharged, at the place where the wire communicated with the signal apparatus and the earth, still time was required. In a long wire so circumstanced much time was consumed, and hence the inopportune effect which had to be overcome. Power, which should be exerted solely in advancing the impulse, was occupied, for the time, in a lateral inductive action. Whatever positive intensity of electricity, communicated by the battery, was occupied in inducing a negative state, on the conducting surface outside the gutta percha, that positive force was taken off from the propulsive energy which tended to send the charge forward in the wire. Whilst charging the near part of the wire-like jar, it was not occupied in pressing forward the wave; and the larger the jar, or the larger the wire, the more electricity was required to charge it, and the greater was the retardation of that electric impulse, which should be occupied in sending the charge forward. Even after the electricity had been sent in at the commencement of the line, and, that part having become charged, was discharging towards the further part, all the intervening parts had to be raised, in succession, more, or less, into the charged state. When the wire was suspended in the air, the lateral Leyden, or static induction, was almost insensible, and all the power of the electricity might be considered as occupied in driving the impulse forward; but when, as in the cable, it was surrounded by either iron, or water, or moist earth, much of the electric force was employed, for a time, in producing lateral charge, before it became current. Hence the cause of the great retardation, producing in some cases a difference in velocity of 100 to 1. These velocities, however, were deduced from results with wires very differently circumstanced, and also of very different lengths:as regarded length, much had yet to be learnt by experiment. Professor Faraday was much interested by what Mr. Siemens had said, as to the results of voltaic induction, and also of magnetic induction, on the wire envelope. These must appear, though they would probably have to be considered as occurring at different moments, in different parts of a wire two thousand miles in length. He could state that, in his experiments, which had been limited to lengths of fifteen hundred and sixteen hundred miles between London and Manchester, with wires doubled up, and under the disadvantage of three, or four in one casing, he distinctly saw two waves at once, and he might perhaps have obtained three, or four. He was not aware what modification would take place, by working with one wire and one casing, compared with the working of several wires in conjunction; but his present expectation was, that the transmission of a signal along the proposed Atlantic cable would probably not occupy more than 2 seconds. That was his hope, from the data that had at present been obtained on the subject; but he had no practical knowledge of the result of an earth contact upon the anterior portion of the wire, or that part nearest to the battery, following a strong impulse charge, or its effect in clearing that part of the wire, and preparing it for a second impulse. With regard to the substitution of a negative charge for the earth contact, he should like to have some more definite results, before expressing any opinion as to the effect of throwing positive and negative charges into a wire of great length. He thought that the experiment of a transatlantic line was one which two such countries as England and America should glory in carrying out. Mr. Edward Highton observed, that the Paper before the meeting did not give any account of the losses, or failures, of several submarine electro-telegraphic cables, lately attempted to be laid down, from which more might be learnt than from a whole catalogue of successful operations. Neither had any mention been made of telegraphing through water, without wires, or any other metallic conductor. The present successful submarine cables were a combination of a perfectly insulated wire, contained within exterior strong iron wires, running in a longitudinally spiral direction. He claimed the merit of the introduction of this kind of cable, and as corroborative evidence, referred to a judgment given in the Cour Impériale de Paris, when the Five Judges of that Court unanimously agreed in the opinion which had been expressed by the Attorney-General of France, that Mr. Highton was the actual inventor of the Submarine Metallic Conductor as now used, lie might add, that the present Solicitor-General for England also concurred in that opinion. Although gutta percha, when buried in the earth, and acted upon under peculiar circumstances, was subject to decay, yet as far as past experience had gone, sea water seemed to be a preservative of that gum. He suggested, that the conducting wire of a subterranean, or submarine telegraph, might be protected from oxidation, or decay at any point of leakage, by means of an electric current. in which E was the electro-motive force; n the number of plates; D the distance of plates; R the specific resistance of fluid; s the section of wire; S the area of plates; I the length of circuit; and r the specific resistance of wire. He then described the effects produced many years ago with two batteries, the one not exceeding the 1/40th of a cubic inch, and the other the 1/1000th part of a cubic inch; as also the application of Frictional, or Hydro-Electricity for telegraphic purposes. The importance of a good system of code signals, where the cost of the intervening wire between two very distant stations was great, could not be overrated, and he exhibited a code by which an almost infinite number of signals could be transmitted with very few currents of electricity. He then described the method of sending messages simultaneously through the same intervening wire in each direction, without interference with each other; and he expressed the opinion, that if a thoroughly insulated wire could be laid and maintained between England and America, there could be no doubt that a much greater number of messages could be transmitted than had been predicted in the Paper. Mr. 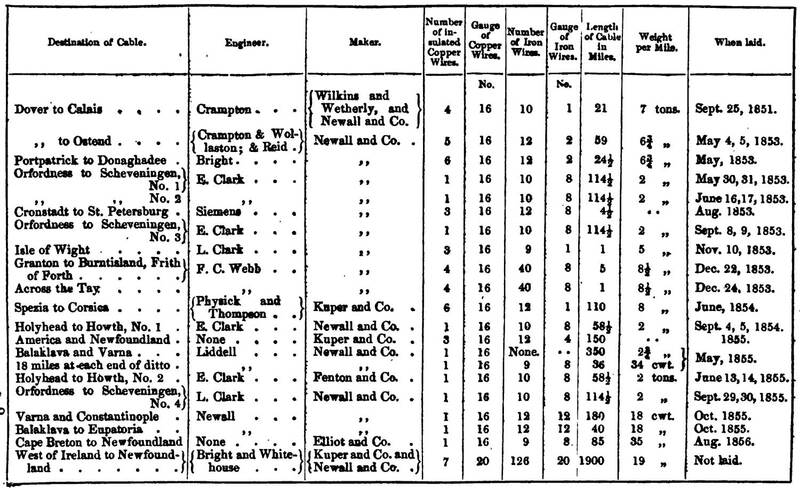 Bright, in reply to questions from different Members, said that the Atlantic cable was then in process of manufacture, partly at the works of Messrs. Glass, Elliot, and Co., at East Greenwich, and partly at Messrs. Newall’s works, at Birkenhead. The best charcoal wire was used, and, as had been stated, to Mr. Brunel was due the credit of devising the kind of outer covering applied to the cable. Mr. Hemans said, although it might be a matter of minor importance, yet it was worthy of some consideration, whether the spot selected for the home terminus of the cable, at Valentia, on the coast of Ireland, was the best that could have been chosen. It was fifty miles distant from the nearest railway station, and a lengthened overground telegraph would be necessary to complete the communication with London. He suggested Galway as a more appropriate spot for the terminus, as there was already a magnetic telegraph from that place to Dublin. The cable could be continued up the Bay to the Isles of Arran, free from danger of interference from the anchorage of vessels. Mr. G.H. Phipps said, about seven years ago, he was engaged professionally to make a report upon the subject of an Oceanic magnetic telegraph. Although not then in possession of the information as to soundings, &c., which was now accessible, he arrived at the conclusion, that whenever the depth exceeded two miles and a half, extraordinary difficulties would be experienced in paying out the cable, whatever its circumference might be, so as to avoid rupture; because, after making an allowance of one-seventh of the weight, for the diminished weight of the cable in water, a depth of two miles and a half gave a strain of about 20 tons to the square inch. He understood, that the projectors of the present Atlantic line, considered that great additional strength would be given to their cable, by the use of fine wire for the strands surrounding the gutta percha; but in his opinion this would not afford a sufficient margin to meet the strain arising from currents and other contingencies, which must be taken into account, in addition to the strain upon the cable arising from its own weight. Any one who had had occasion to strain a rope of considerable length transversely in a river, with a current of two miles an hour, would be able to appreciate this remark, with regard to the force of the currents which would probably be encountered at sea upon two, or three miles of cable. The failure of the attempt to lay the line from Sardinia to the coast of Africa, showed the danger to be apprehended from any sudden check upon the cable. In that case the cable was paid out at a faster rate than the vessel progressed, so that although an allowance of fifteen miles had been made, the cable fell short, and they were obliged to let it slip. He did not think that the questions of the depth, and of the influence of the currents upon a long cable, had been sufficiently attended to. Mr. Crampton remarked, that several questions which had been asked in the course of the discussion had not yet been answered. First, as to the strength of the wire. He believed that the breaking strain would be about 3 tons, and, in his opinion, that was not sufficient to guard against the contingencies that might be expected to arise. With regard to the failure in the attempt to lay the Mediterranean cable, it was evident, that when paying it out, the speed at which the vessel was going was not known; whereas the cable was really going out faster than the vessel was progressing; and they imagined, that by lessening the speed of the vessel, the tension upon the cable would be diminished; but by this proceeding the vessel lost her steerage-way, and got out of her course. The weight of the cable, and the depth at which it was being laid, tended to produce those results. Having given the subject a great deal of consideration he had arrived at the conclusion, that the proposed Atlantic cable should be made of such material as to afford the greatest strength with the least weight; taking care that the weight was sufficient to sink it rapidly. The iron wire covering adopted did not fulfil that condition. Now a cable could be made, of steel, of the weight of about one ton to the mile, of sufficient strength to meet almost any contingencies that might arise. Sudden changes in the weather were most to be feared in the laying of the cable. Recently, when repairing the Calais cable, one day they had fine weather, and the next day a gale came on which obliged them to run into Ramsgate. He had hoped, that more definite opinions would have been expressed on the important question of the Atlantic Telegraph, and the silence which had been observed might lead to the belief of the proposed plan being generally approved by the profession. This, however, was not the fact. Contingencies should be prepared for, which was not the case with the present cable, and he must record his opinion, that the risk incurred was at least imprudent.